Bond Economics: Less Fiscal Drag Means A Brighter 2014? Less Fiscal Drag Means A Brighter 2014? 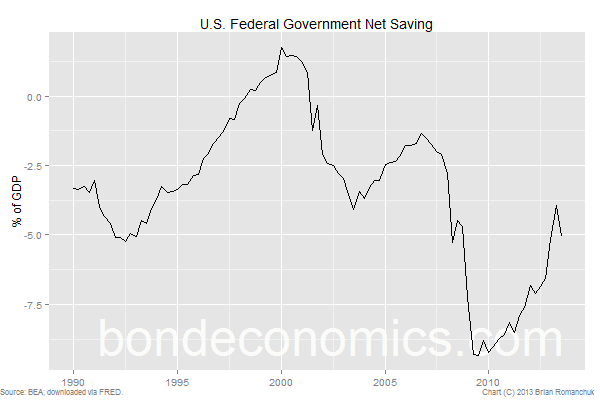 The chart at the top of this post shows the U.S. Federal net saving (negative Federal savings corresponds to a Federal fiscal deficit). The magnitude of the negative saving flow has been diminishing over recent years, in response to limited austerity and passive fiscal policy tightening. The chart below shows the change in the flow of net savings on an annual basis (smoothed with a 2-quarter moving average). We see that for the period shown (post-1990), there is normally an increase in savings (falling deficits) at a rate of 1% of GDP per year during an economic expansion. This can be interpreted as a steady drag on incomes in the other sectors of 1% of GDP per year. 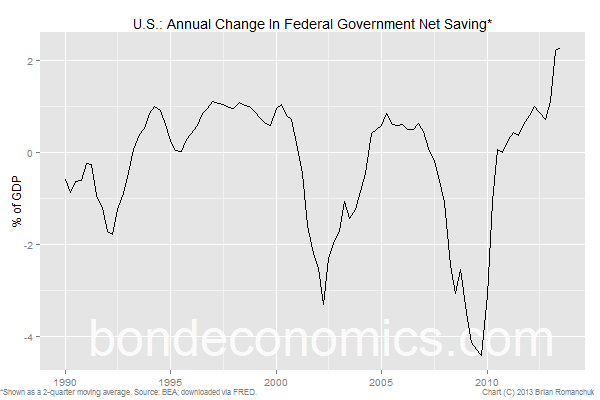 This continues until the private sector melts down in recession, at which point Federal dis-savings jumps. However, the increase in the savings flow jumped to 2% of GDP in 2013. This represents an increased drag of 1% of GDP relative to normal. As the chart below shows, this coincided with a drop in nominal GDP growth of about 1-2% as well (Ricardian Equivalence - ha!). To be clear, the relationship between GDP growth and the change in savings is potentially complex (e.g., people could use existing savings to pay tax). 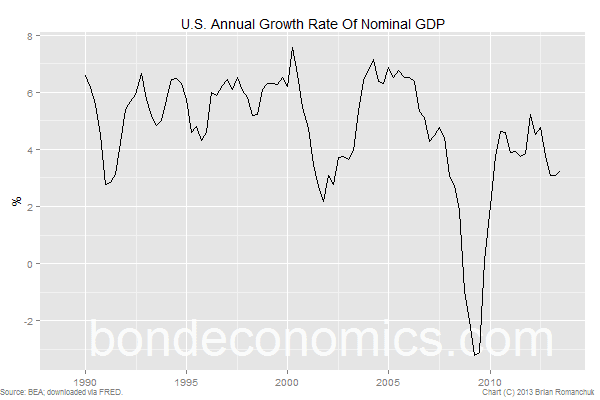 That said, it would seem reasonable to suppose that nominal GDP would return to its 4-4.5% trend that we saw earlier during this expansion, if the drag also dropped back to its trend level of 1% of GDP. Even if discretionary fiscal policy is less restrictive, there will still be a drag from passive fiscal policy. The wild card, as always, is the state of “animal spirits” in the private sector. Debt-fuelled private sector spending could cause nominal GDP growth to pick up towards 5% or eventually 6%. I do not see a catalyst for this, although it may be that the exuberance in the equity markets could finally be reflected in business activity. However, as Warren Mosler notes, there is always the risk of something triggering a retrenchment. The cycle is long in the tooth, and an inventory correction is a possible scenario. As a final note, the equity market party in 2013 may trigger a tax hangover in 2014. It is possible that there will be an uptick in capital gains taxes paid, which will reduce the fiscal deficit even further. However, it seems that these taxes will largely be paid by those with high incomes, so the “multiplier” on this tax increase should be relatively low. But it would be good news for those people who fret about fiscal ratios.